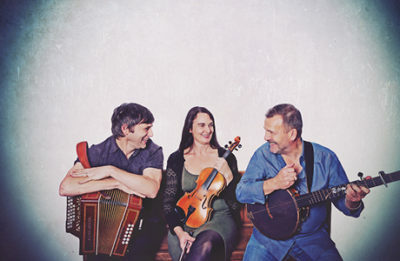 Brought together by the sheer joy of making music with each other, Martin Simpson, Andy Cutting & Nancy Kerr – three of Britain’s finest roots musicians – will create one of the stand out highlights of the autumn season at Lighthouse, Poole’s centre for the arts on 25 September. Having appeared together many times in different combinations over recent years it was inevitable the trio would formalise the union and their debut album, Murmurs, is proof positive (if any were needed) their whole is even greater than the sum of its considerable parts. Congratulations on the album, Murmurs, is it the album you imagined the three of you would make, how did it evolve along the way? It is the album we set out to make, in that we got together for the joy of exploration and playing, and took it on the road to do it. It was so obviously working and so enjoyable that we went into the studio to record the experience. How did you decide which songs to do, did songs arrive fully formed or did you work on them together? We all brought material that we thought would work, that we felt everyone would enjoy, and then we played together until it became the core arrangement. The way we play is flexible, so I think it continues to evolve within each piece. What brought the three of you together and will this be an on-going collaboration? I’ve been playing with Andy since 2007 at the suggestion of my wife Kit and during that time I’ve worked with Nancy on a number of projects – Kerr and Faran, my own, The Full English and The Elizabethan Session. It so clearly works well, and again it was Kit who suggested we form a trio. It’s on-going! It feels like a very contemporary record – the traditional Richmond Cotillion gets a raucous treatment, Some Old Salty flirts with funk, while lyrics like Dark Honey and Not Even the Ground could only be from the 21st century – is there a freedom in stepping outside of your individual careers? There is a freedom in what we do, it allows us to improvise and relax into the music. There are tunes that I’ve wanted to play for 40-plus years that I’ve finally been able to play because of the trio, Richmond Cotillion being one. I feel able to bounce anything off Nancy and Andy, it’s not genre-specific, we bring everything we know to this music. What have you learned from making this album and playing with Andy and Nancy? That I want to do more! What gets you going as an artist? The most important thing to me is music that moves the heart. That’s what I want to hear, that’s what I want to play. I love playing live, I love recording, I love being at home with my family, walking the dog, looking at bugs and birds and plants, I’m a lucky man. How do you remain receptive to ideas for the next song, the next note, or even the next project? It doesn’t seem to be a problem, I get moved, angry, sad, touched by beauty… moved by a tune. I’m also very fortunate in that people keep asking me to work with them. I’m working with Dom Flemons, ex- of the Carolina Chocolate Drops in October, and I have lots of solo work coming up either side of that. I’m writing new songs, playing lots of different instruments and just generally trying to be better. Then next year I’m touring again with the trio and with the wonderful Martin Taylor… and who knows what else will come up?